5520D series Duotronic signals are 24 Vdc diode-polarized, heavy duty, high-decibel signaling appliances for use in fire alarm applications where a supervised signal is required. Colored sage gray, 5520D Series signals will function as either a horn or siren by setting an internal tamper-proof switch. The 5520D Horn/Siren has no moving parts or contacts to wear out. It requires no maintenance or lubrication. The horn/siren operates with very low current consumption and does not require extra current on start-up. The horn's predominant frequency is 1.1 kHz. 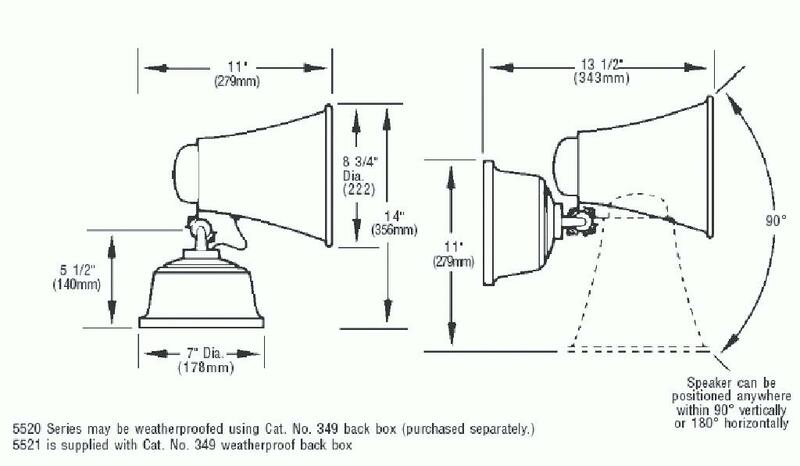 When horn output is selected, the frequency rises and falls from 300 to 3000 Hz every 3 seconds. Once mounted, the horn/siren switch is tamperproof. The horn is suitable for coded applications, while the siren is not. The 5520D Series can be made suitable for outdoor weatherproof applications by adding the catalog number 349 Backbox. 5520D signals are ideal for indoor or outdoor applications including schools, factories, commercial occupancies, and lumber yards. They can be used where standard bells or horns are not satisfactory, particularly in areas of high noise level. The unit will function as a Horn or Siren with just the flick of a switch.